A stunning gift designed to send a big thank you! We take a bottle of rich, bold California red wine, engrave it with a Thank You theme along with your personalized message, name or date. This memorable gift arrives presentation-ready inside an enduring gift box. They'll love the wine and keep the bottle forever. 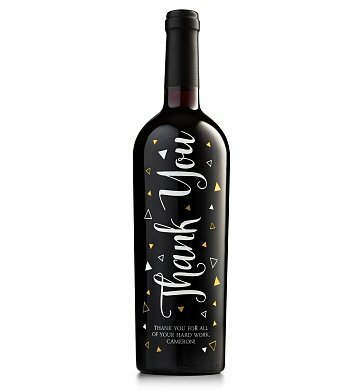 One bottle of California Winemaker's Red Wine engraved and painted with a Thank You theme and your chosen personalization. Personalize It! Your wine gift comes sandblasted with your personal message and theme of choice, and is then treated with a smooth, lustrous metallic paint to complete the presentation. Sandblasting is a distinctive engraving technique that creates a permanent, semi-opaque etching onto an item's surface that looks both stylish and professional. Engraved Thank You Red Wine Bottle is a hand delivered gift. These gifts are delivered by one of our local design centers located throughout the United States and Canada. Same day delivery is available for most gifts when ordered before the cutoff time. The cutoff time for Engraved Thank You Red Wine Bottle is 2 PM in the recipient's time zone. California Winemaker's RedAn aromatic and smooth California red blend with a light finish. This ruby red wine has a rich bouquet that yields to dense flavors of fruit and aromatic spices with a light, smooth finish. Your chosen name, date or special message is personalized on this keepsake bottle. Securely packaged to safeguard the shipping process, arrives presentation-ready.